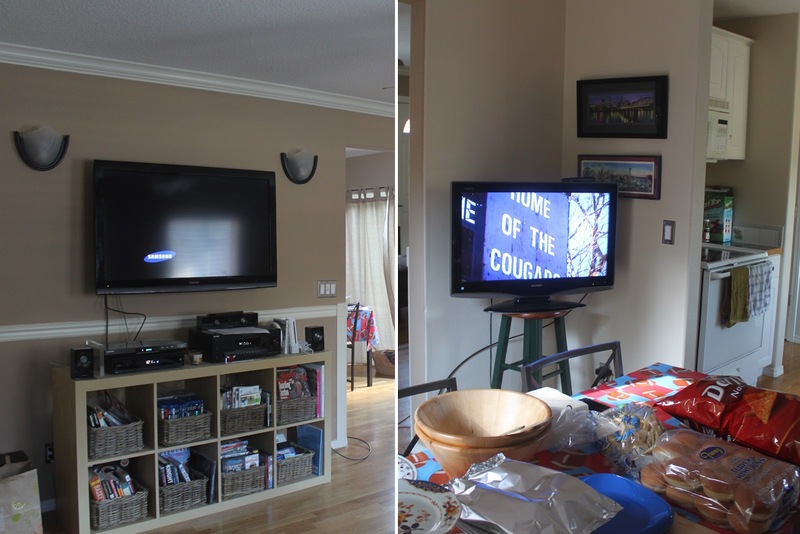 This past Sunday we had our First Annual Super Bowl Party. It also happened to be our first party in the new house! While most of us didn't really care about either team, it was a great excuse to have everyone over, make a ton of food & drink a lot of beer with some of our best friends & family! 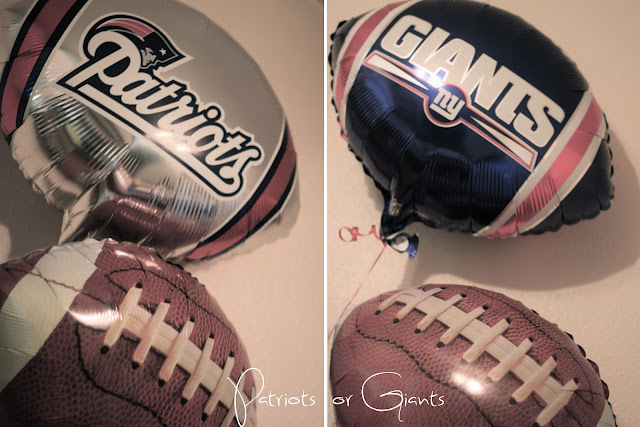 I thought it would be fun to get balloons for BOTH teams. to re-fill on food & booze. Our first brilliant idea of the day! Our second brilliant idea of the day comes from Luke & his cousin Jenni. 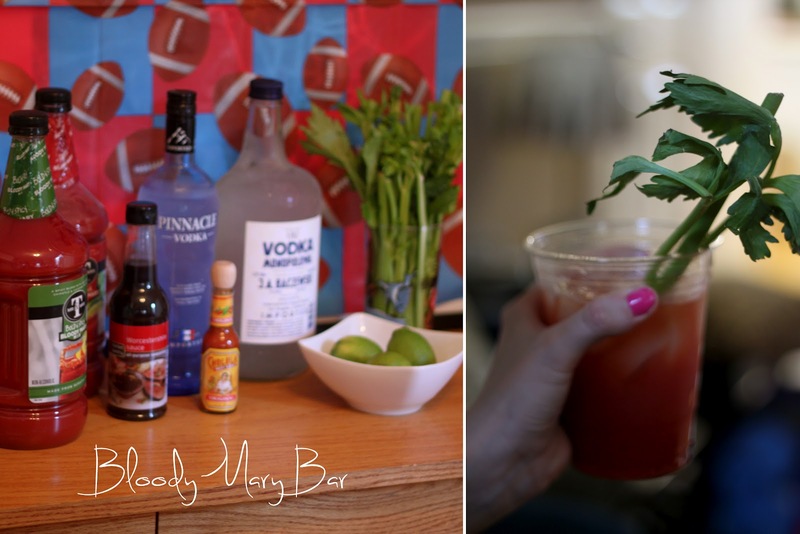 They came up with the idea of a Bloody Mary bar. Since the game was on at 3:30pm & guests we likely to be showing up an hour early, it was the perfect time of the day for a Bloody Mary. 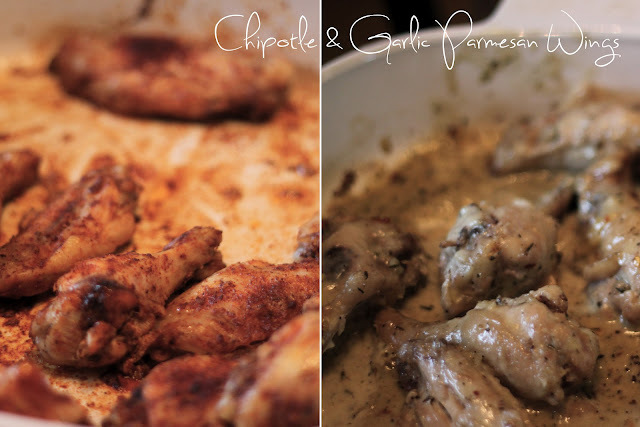 It turned out to be a HUGE hit with everyone & nothing was left over by the end of the day! We had some healthy food, too! Sue's deviled eggs, guacamole & chips, & beef sliders with all the fixins! Football shaped rice krispie treats! A must for the Super Bowl! A puppy that was infatuated with the Puppy Bowl at Halftime! One crazy party host that was a little too excited about the Vodka! look at all those yummy treats!!! Aaaand this is why I love living in Portland - every weekend is SOME reason to eat lots of good food and drink god beer with friends! My friends and I were the same about the game... Not too invested in either team, but just happy to have another reason to hang out! Looks like a good time was had by all, great pictures! yumyumyum!! 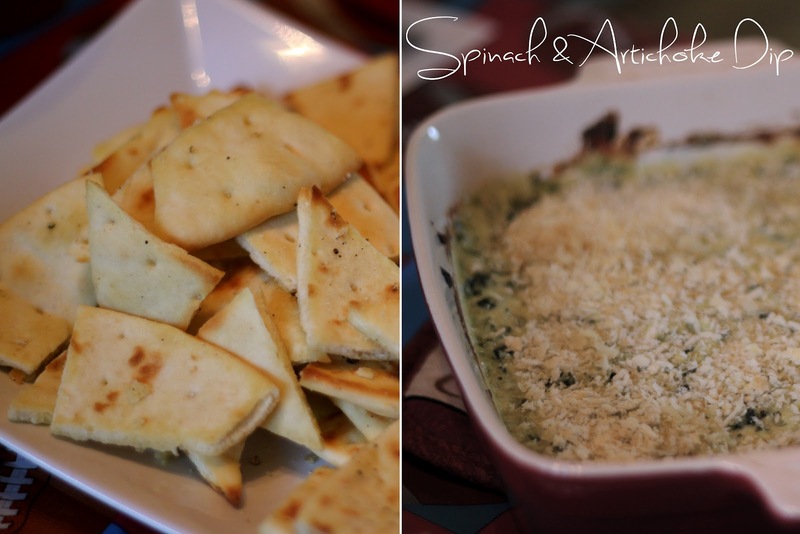 I made spinach artichoke dip as well for the super bowl but yours looks amazing!! daaaaang girl, you went all out! i want to come to one of your parties, haha, looks like such a fun time. How cute - a bloody mary bar! I love it. Looks like you had a fun Superbowl Sunday :) Just stumbled upon your blog and the header is SO SO CUTE!!! Oh, wow! All that stuff looks so delicious. I especially love the football shaped rice krispie treats :) I love the super bowl. even though i tune out most of the game, i love getting friends together to eat and drink for a few hours.